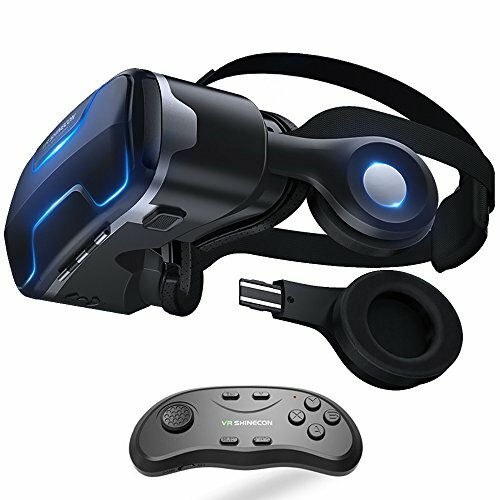 Isunpow VR headset bring you a home cinema and gaming room,allow you experience real adventure and fight game,visit the scene you want with your lover.It is brilliant,comfortable and adjustable gadget with various fun. Versatile Buttons on Bottom:The left button:For video or music play and pause,Volume up,Volume down,answering and rejecting calls. The right button=Touch screen button:For shooting games only. Multifunctional knobs on Top:The right and the left knobs is for adjusting pupil distance,let your eyes close to the screen so that you can see it more clearly. The middle knobs is for adjusting separate focal length,narrowing your vision,easing eye fatigue. Two Cracks and Removable Front Panel For Heat Dissipation:No need to worry about the heat caused by long time use will hurt your phone. Powerful multifunctional bluetooth remote controller:Two kinds of mode, turn it to the game mode and it become a gamepad, turn it to the key mode and it can control the camera and music of the phone. 2.if you find the lens not focus or not clear,please tear the protection film on the lens. If you have any questions about this product by ISUNPO, contact us by completing and submitting the form below. If you are looking for a specif part number, please include it with your message.